About a week ago I had my first homeschool nature journal club meeting for the North Metro Atlanta area. This has been something I have wanted to do for quiet sometime, but have always been too nervous to start. Well I finally took the plunge and the first meeting was fabulous. Nature journaling is something that myself and my children are really passionate about and we have been nature journaling since we started homeschooling in 2011. 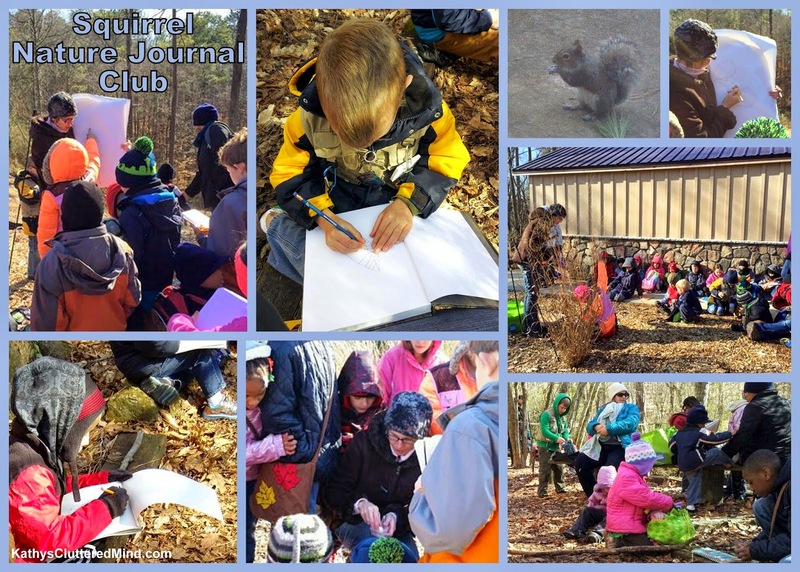 I wanted to share the joys and importance of nature journaling with other families and so Homeschool Nature Journal Club - Metro Atlanta was created. I will try my best to share each of our monthly meetings on my blog in hopes that it encourages you to start nature journaling with your children or perhaps even start your own club. First let me tell you how to create a nature journal club group for those that are interested then I will tell you more about our first meeting topic and share exactly everything we covered and the resources we utilized. It is really not as hard as it sounds. I created the group on Facebook, because for me that is the easiest way to communicate with a large group and post events. I decided to offer meetings for the entire North Metro Atlanta area (which includes Cherokee County, Cobb County, Fulton County, Gwinnett County and more), but you can make it for a smaller region if you want, like just your city or county. I offer two meetings a month and because my group covers multiple counties I offer one on the west side and one on the east side to try to accommodate everyone. In the past I have arranged nature walks with another group I am in and was very disappointed when the day of the nature walk no one or only a couple of families showed. I felt like all my hard work had been for nothing. So with this new, larger group I charge each family a small fee from $5-$7. This basically pays for my time and any supplies I may need for the meeting (like handouts, craft materials, books, etc). For each meeting I pick a topic and different location so families can get exposed to a variety of nature preserves, parks, etc. Some of the upcoming topics include squirrels, GA birds, mushrooms, worms, pine cones and conifers, macroinvertabrates, spiders and more. At each meeting I talk about the topic, read a book, provide a drawing demonstration, have some sort of hands on activity and then we hit the trail for nature journaling. For the first meeting I covered what nature journaling is, the reasons why nature journaling is so important, as well as what type of information to put in a nature journal. Be sure to view and download my nature journaling 101 handout. Of course it is very important to give families a list of the supplies they will need to bring to nature journal club. Nature Log - Targeted for children, ages five to twelve, Nature Log Kids is a journal that lets youngsters note encounters with nature. Pages to paste photos and artwork add a perfect blend of creativity to each and every entry. Guided Nature Journal - No one could describe Nature Journal as a blank book. Clare Walker Leslie has transformed what could have been an ordinary diary into something truly unique. The text and illustrations offer just the right amount of inspiration and guidance to help the journal-keeper begin and succeed at making this book his or her own. Standard Journal - This stylish journal is a must-have for everyone, from artists and students to writers and professionals! Featuring a natural cork cover that's soft to the touch, this unlined blank book is ideal for note taking, sketching, doodling and more. Our first meeting was fantastic and my heart jumped for joy when I read the comments parents posted afterwards on the Facebook group. After I covered the nature journaling 101 information I introduced the children to the KWL chart. We discussed what they knew about squirrels, what they wanted to learn and hopefully later they discussed all they had learned with their parents. Since we are unschoolers we use KWL charts a lot. After the KWL chart I read some interesting squirrel facts to the children. While reading the facts though I worked in some questions, like "what is a mammal," and "what is an herbivore." This helped keep the children involved and interested. After we covered the facts I asked if anyone had any questions. The weather was a bit chilly so we didn't get around to reading the book I had planned to read, Burgess Book of Animals for Children. So I passed around the red squirrel skull I purchased on Ebay and showed the children how to tell that squirrels are rodents (long orange teeth). They all really loved the skull!! I then showed the children how to draw a really simple squirrel. This YouTube video was a great help. After the drawing lesson I verbally gave the children a list of questions to think about as they observed the squirrels (these were taken out of the Handbook of Nature Study book). Then I handed out little cups of birdseed and gave them each a little squirrel ornament goodie for being so well behaved. I also encouraged them to do journal entries in between our meetings and told them at the next meeting I will ask for volunteers to share some of their entries. Then we hit the trial! During our walk we didn't see many squirrels...can you believe it. Luckily though most of the children said they have squirrels in their backyard so they promised to go home and watch the squirrels in their yard. We did all sit down though to create journal entries. Some children journaled about squirrels, others journaled about other things like trees and birds. Be sure to download a copy of my squirrel nature journal club guide. The first meeting was tons of fun and I am looking forward to so many more fun nature journal club adventures. I hope this post inspires you to get your children outdoors!